I am available for school and library visits to conduct author talks and writing workshops. Meeting young readers and talking to them about writing, stories and the life of an author is one of the perks of the job. I can be booked for author talks and writing workshops through the speaking agency Booked Out. You can call them on (03) 9824 0177 or email — bookings@bookedout.com.au or check our their website. 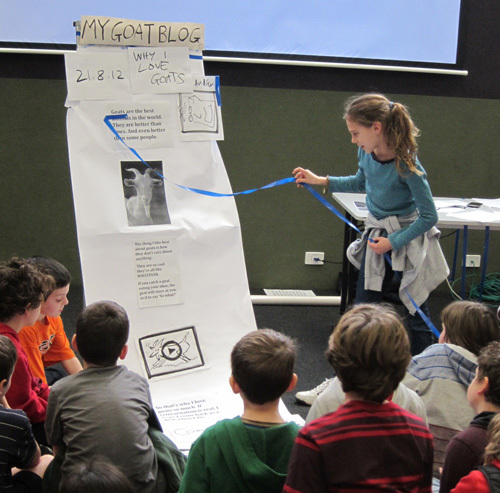 A blogging workshop with primary students. Getting started on a story can be one of the hardest aspects of creative writing. In this workshop Andrew discusses how his writing is heavily informed by his real-life experiences, whether he’s writing a fantasy story about grim reapers or a story set in the real world. Students then undertake a series of creative writing exercises, which draw on aspects of students’ own lives and demonstrate the numerous different ways a story can begin. This workshop is idea for middle-upper primary students and lower secondary students. It is especially good for students who have trouble getting started on writing projects, as it focuses on workshopping, writing prompts and drawing on real life experiences. For lovers of adventures stories that are funny, plot-driven, page-turners. In this workshop students learn how to structure stories to write a fast-moving and entertaining plot. Close attention will be paid to creating high-stakes action sequences, plot twists and humourous elements, be they funny situations, characters or narrators. This workshop is ideal for middle-upper primary students and lower-secondary students. It’s great for both sexes, but especially boys who love adventure stories and are keen to develop and learn about writing skills related to plot, action and humour. Retellings of well-known fables and stories can be wonderful to read – and just as much fun to write. This session explores the question of how to retell and reinterpret fairy tales, myths and legends to make them your own. Using fairy tales, Aesop’s fables and commonplace legends (such as King Arthur, the Pied Piper of Hamlin, Frankenstein and the Grim Reaper) as examples, reinterpretations of well-known stories are explored, discussed and dissected. Students then learn how to reinterpret stories themselves, through creative writing exercises that culminate in each student writing a short story featuring their own, unique twist on an existing fable or legend. This is a fun, interactive and productive workshop ideal for middle and upper-primary and lower-secondary students. Writing your own blog is a great way to express yourself, get your writing out in the world and practise your writing skills at the same time. In this workshop Andrew shows and discusses some of his favourite blogs and writers online, before sharing a suite of useful tips and tricks for online writing that address things like blog post structure, content, style, voice and use of multimedia. Drawing on examples from his book The Greatest Blogger in the World, Andrew delivers some helpful tips about online etiquette such as what information is appropriate for online, what information is best withheld, what you need permission to write or post about and how to spread your blog to friends and family. Students dream up their own blogs, workshop ideas for blog content and begin writing blog posts – before pitching their blogs as a whole to the group.